Google Maps has been helping us navigate unfamiliar terrain for ages now. It’s been integrated into various applications we use daily, and for many of us it is our de facto smartphone GPS system. And now it’s taking us inside. Or at least it will for Android users. 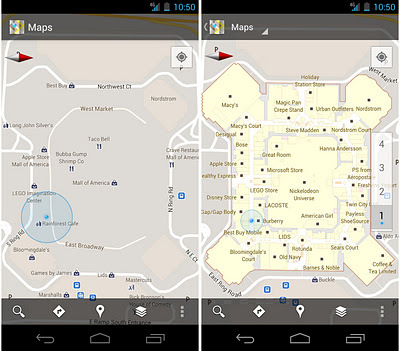 Google Maps 6.0 for Android launched today with functionality to help you tour the indoors. “Detailed floor plans automatically appear when you’re viewing the map and zoomed in on a building where indoor map data is available. The familiar ‘blue dot’ icon indicates your location within several meters, and when you move up or down a level in a building with multiple floors, the interface will automatically update to display which floor your on,” Google says. The indoors mapping capability isn’t universally available yet, although Google is working on expanding its list of partners. At the moment, Google says it has a good selection to start with, including stateside international airports and Japan’s sprawling subway system. Currently available locations include the Mall of America, IKEA, The Home Depot, a handful of airports, and a few department stores. This new system means you can use Google Maps not only to get from point A to point B, but the find the bathrooms, kiosks, and ATMs along the way. It’s relatively new territory: we’ve all grown accustomed to GPS assistance, but not once we’re inside. It’s a new—and long term—project, so don’t expect total reliance on it just yet. 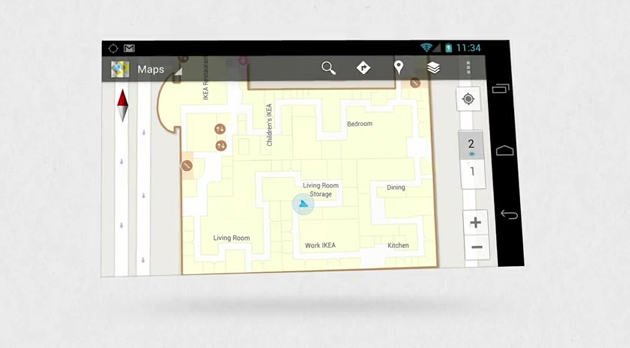 Google’s still working on integrating locations as well as the service’s accuracy. Is Microsoft Office coming to the iPad?